My son is the biggest TMNT fan. I admit he has been spoilt with all his characters but a lot of them are treats after hospital procedures especially his big TMNT Lair. He got that for being so brave having brain monitoring in hospital for a week. 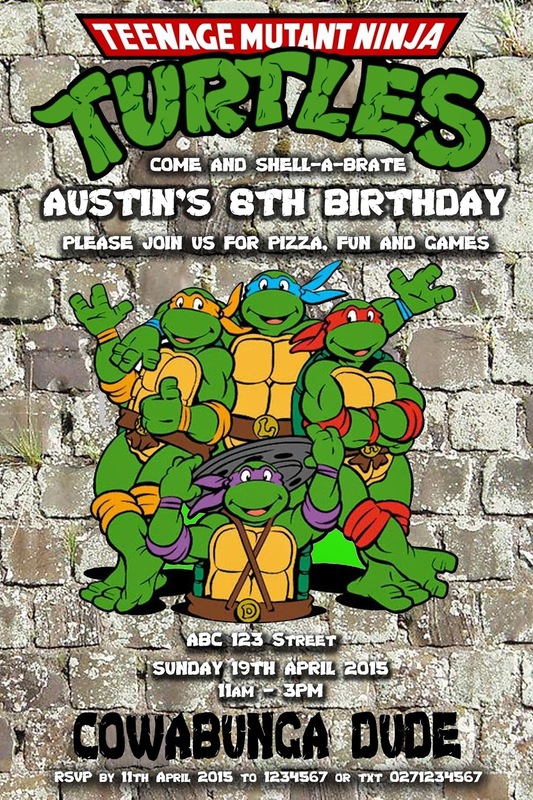 Austin was a great age this year to help me plan games for his party. We searched for information on the internet then adapted the ideas. Most of the decorations we used were Austin’s Ninja Turtles and his playsets. We blew up approx. 50 balloons and brought a five piece banner to stick on the wall. I got a party 50% off voucher for an online party shop so with the $40 voucher (that cost me $20) I got the banners, 2 packets of Ninja Stars and a huge blow up Leonardo. Friends Arriving... one very happy and excited boy! TMNT shaped biscuits and jube Lollies. We also had lime ice-cream in cones with chocolate topping (similar to a turtle with a hard shell) but ran out of time so my four kids made them for supper as an end of day treat. Once again I designed a cake I wanted and got a lovely local lady to make it for me. Austin thought it was amazing so it made it all worth it ! This is always a favourite. I thought the kids would be a bit over it being eight but they still love it. Each wrapper had a chocolate treat for the kids and the winning prize was a make your own TMNT turtle kit. I brought some large pizza boxes and printed some target numbers in the colours of the four turtles. The object of the game was to throw the foam Ninja Stars into the pizza box and if one landed on the targets you earned those points. We had 15 kids so set up two games. We played two rounds then the two top players played off for the prize. They both did so well so each one was awarded a TMNT figurine. Austin and I made the Piñata. His favourite character is Leonardo so I tried my best to make it look like him. I thought it looked a bit scary but the kids loved it. They all had turns at smashing it with a Piñata stick and finally when the Piñata was opened the kids ran in and grabbed lots of yummy treats and goodies. 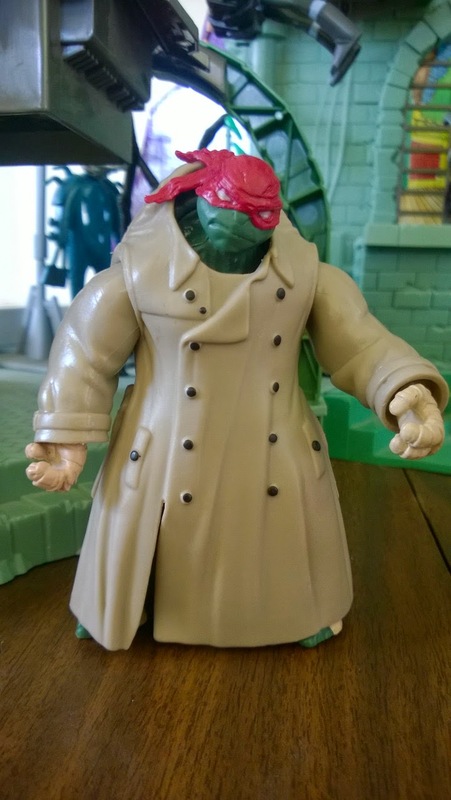 Raphael in Disguise was one of Austin’s new characters. We played the Chocolate Game where all the kids sit in a circle and try to roll a six on the dice. When a player gets a six they had to dress up as Raph and put on TMNT mask (they were red glasses from a TMNT game we had), green gloves then cut single pieces of chocolate from the block and eat it. They keep going until another player rolls a six. Towards the end we stopped the game and shared the rest of the giant block of chocolate between all the kids. I brought this game. The object of the game was to stick the pizza sticker on the game poster. Person who got closest won a prize. Prize for this game was a TMNT drink bottle and we also gave a bonus prize to the person who put the sticker in the most unusual place. We chose a little girl who put it on the head of one of the turtles which looked like a party hat. This game was thought of when I saw another of Austin’s new characters. 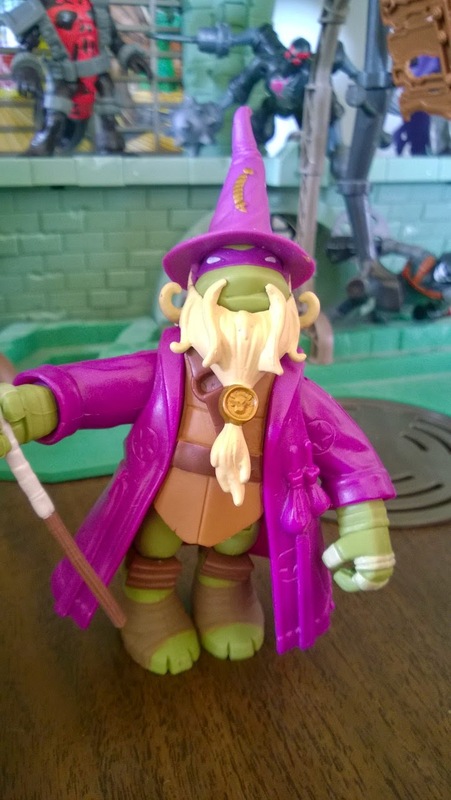 It was Donatello dressed as a Wizard. I went to our local building shop Mitre 10 and brought a large thick board for $7.00 and a kit to drill tholes. We took the board home and drilled 20 holes in the board. Spray painted it green and put plastic cups in the holes. In each cup I put little TMNT prizes and in one cup Donatello’s Wizard Hat. The tops were covered in soft tissue paper (TMNT colours) so no one could see inside the cups. Objects to throw at the cups were little green bean bags I made with TMNT coloured stripes. I made a little banner for the top of the game and it was already to go. Each child lined up and threw the bean bags at the game. They had two attempts and if they got a hole in the tissue they received that cup. If they missed they went to the back of the line for another go. The winner who found the cup with the Wizard’s hat won a TMNT pencil case with stationery and a small TMNT figure. I always love to do treasure hunts but needed this to be age appropriate for the kids. I brought 16 small Pizza Boxes and set to making pieces of pizza for our game. Each set had 11 pieces of pizza topping, pizza base and a cover for the pizza box. I printed these and laminated them. All the pieces were put in bags and hidden outside around the property. The kids had to make their pizza boxes and glue a pizza label to the top. Grab a Pizza Phone Order and follow the instructions finding Pizza pieces for their pizzas to put on a base. When they had their pizzas completed they could had to deliver the pizza to Leonardo (our big blow up turtle) who in exchange for the pizza paid them in Chocolate coins. Each child got to take home their pizzas. 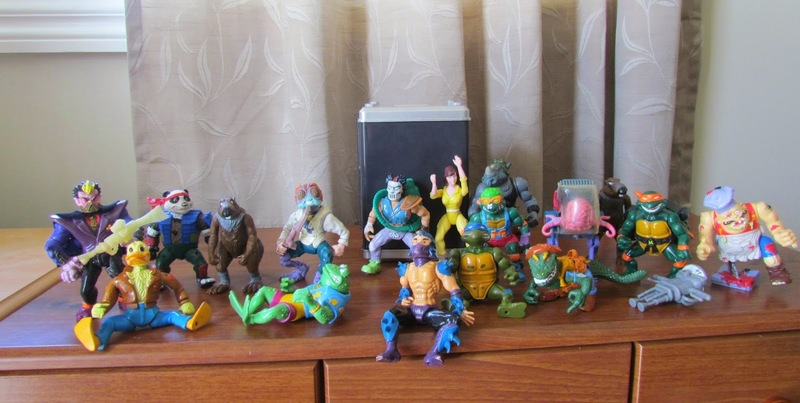 And lastly the thing that kept a lot of the kids entertained for ages were Austin's TMNT collection. Here are some photos of what he set up for his birthday. Since the TMNT movie came out last year a lot of the TMNT things were on special so it was a great time to buy up some little treats and prizes. Each child took home a little thank you treat for coming and celebrating with Austin. Loot Bag Items: Green Bubble Wand, TMNT Lollies & TMNT Biscuits. TMNT Frisbee, Whistle, Game, Stickers, Kaleidoscope, Lollies and TMNT trading cards. Austin had an amazing day with all his wonderful friends. Thank you everyone for making his day so great, and a huge thank you for all the wonderful gifts. He is a very lucky boy to have you all in his life.